In an article titled “Constraints on the location of a possible 9th planet derived from the Cassini data“, scientists published their result. 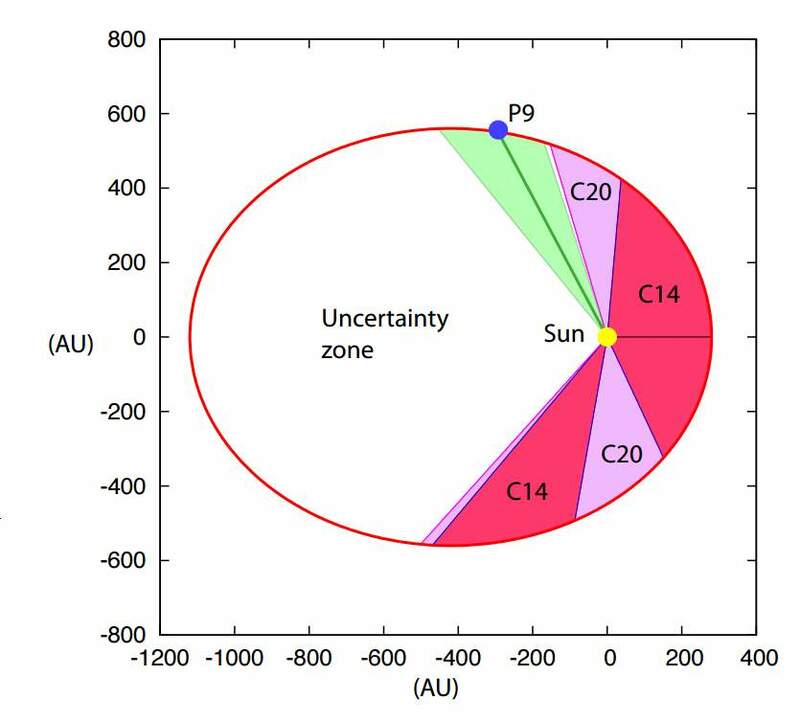 In the image below, the green zone is the most probable zone for the new member of our Solar System. Allowed zone for Planet Nine. The red zone (C14) is excluded by the analysis of the Cassini data up to 2014. The pink zone (C20) is how much this zone can be enlarged by extending the Cassini data to 2020. The green zone is the most probable zone for P9 (v ∈ [108° : 129°]), with a maximum reduction of the residuals at v = 117.8° (blue dot P9). The white zone is the uncertainty zone where the P9 perturbation is too faint to be detected. Planet Nine does not have an official name, and it won’t until its existence is confirmed, typically through optical imaging. Once confirmed, the IAU will certify a name, with priority typically given to a name proposed by its discoverers. It will likely be a name chosen from Roman or Greek mythology. In their original paper, Brown and Batygin simply referred to the object as “perturber“, and only in later press releases did they use the nickname “Planet Nine“.